A study on Alzheimer's disease on 86 Alzheimer's patients and 79 healthy elderly controls show that the Alzheimer's patients have four times higher levels of DDE in their blood compared to the healthy controls. DDE is a metabolite (substance produced during metabolism) of DDT. Although the cause of late-onset Alzheimer's disease (AD) is not yet clear, researchers believe that factors such as genetic, environmental and lifestyle can influence the development of the disease. The latest finding linking DDT to AD reinforces the link between the environment and AD. Dichlorodiphenyltrichloroethane (DDT) is a pesticide used in agriculture and mosquito control. It was used in the United States from the 1940s until its ban in 1972 over environmental and ecological concerns. Despite the US ban, DDT is still being used in many countries. One major reason for its use is the control of malaria spreading mosquitoes. DDT can last up to ten years in the body. People are at risk to continuous exposure to the chemical because it can persist in the environment for a long time and that food products that come from countries using DDT will contain traces of the pesticide. This can also explain why elderly people are more susceptible to Alzheimer's disease. Scientist believe the metabolite DDE accumulates in the tissues over the years. As people get older, the levels of DDE rises making them more susceptible to AD. In 2006, the World Health Organization called for DDT's reintroduction to fight malaria in African countries. The results are scheduled for publication Jan. 27 in JAMA Neurology. "This is one of the first studies identifying a strong environmental risk factor for Alzheimer's disease," says co-author Allan Levey, MD, PhD, director of Emory's Alzheimer's Disease Research Center and chair of neurology at Emory University School of Medicine. "The magnitude of the effect is strikingly large -- it is comparable in size to the most common genetic risk factor for late-onset Alzheimer's." The lead author is Jason Richardson, PhD, assistant professor of environmental and occupational medicine at Rutgers-Robert Wood Johnson Medical School. Richardson collaborated with Levey at Emory University Alzheimer's Disease Research Center and Dwight German, PhD at the University of Texas Southwestern Medical School's Alzheimer's Disease Center, replicating the findings in independent samples from two regions of the country. In the United States, DDT (dichlorodiphenyltrichloroethane) was used extensively in agriculture and for mosquito control from the 1940s until it was banned in 1972. Concerns over DDT's effects on wildlife, especially birds, played an important role in the history of the environmental movement. Around the world, DDT's use continued in many countries until more recently. Public health authorities have said that DDT was critical for controlling mosquitos that spread malaria in several countries. For this reason, the World Health Organization called for DDT's reintroduction to fight malaria in African countries in 2006. The findings on DDT and Alzheimer's emerged from previous research conducted by Richardson, with Emory and UT Southwestern colleagues, on the connection between another pesticide, beta-HCH, and Parkinson's disease. 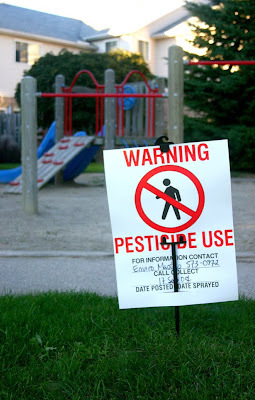 Richardson first began examining the pesticide connection when he was a postdoctoral fellow at the Emory Center for Neurodegenerative Disease with Gary Miller, now associate dean for research at Rollins School of Public Health, between 2002 and 2005. In the current study, DDE levels weren't the sole determinant of whether someone gets Alzheimer's; some Alzheimer's patients had non-detectable levels of DDE and some healthy control samples had DDE levels that were relatively high (top third). The researchers say that genetic risk factors may combine with environmental exposures to drive disease development.